"No one has thought more about the issues related to managing pension money better or longer than Ambachtsheer. His writings are a must read for serious people with a desire to serve their beneficiaries well. This new book is destined to become a classic." "Ambachtsheer's latest book is both substantial and timely, bringing together the latest thinking on the global pensions industry. He mobilises both its theoretical and creative aspects in what is seen as an increasingly necessary and even righteous cause." "Trustees of pension funds often decide on 'how' before they decide 'what' they should be doing. This book gets the order right: from objectives, to strategy, and then measuring outcomes. Keith has always been the leading voice of reason on pension fund design and management. This book is no exception." "Providing adequate pensions is a key challenge for ageing societies. 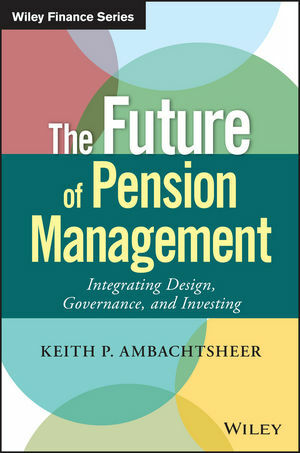 In this new book, Ambachtsheer proves again his unique ability to combine theory and practice in unscrambling the complex problems surrounding pension design, governance, and investing. It is compulsory reading for all pension professionals around the globe." "In his new book, Keith translates classic theory from famous economists into concrete solutions for pension funds. The result is essential reading for those who believe the future of pension management will start today." "Once again, Keith translates academic insights into the real world of pensions. He starts with pension delivery, from which he works backwards to deduce plan design, governance and investment strategy – always with the objective to benefit plan members. Anyone with an interest in pensions will enjoy reading this book." "In his new book, Ambachtsheer has successfully combined all of the essential elements of our industry – from plan design, to governance, to investment strategy. It is a must read for everyone in the pension industry, including policy makers, plan trustees, and investment managers."